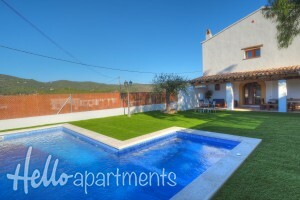 This charming house situated in the town of Sant Pere de Ribes includes free parking place, is less than 1km away from the town center and just few minutes’ walk to the bus station going to Barcelona and the neighboring towns. Sitges and the sandy beaches are less than a 10 minute drive away and the main motorway to Barcelona just 2 minutes away. Barcelona airport is within 30min drive. It was recently restored so that everything is brand new, but it has been exquisitely decorated with period furniture, traditional pictures and Victorian style carpets as to retain the original character and beauty of ancient times. It boasts the comfort of all modern amenities such as a fully fitted kitchen, central heating, electric towel rails or ceiling fans in all rooms, without killing the rustic charm present in all corners of the house. The original exposed wooden beams have been kept, just as the vaulted ceilings and the white washed walls. The porch outside has been carefully updated with the same materials used: in total 16 large tree trunks have been used to preserve it just the same way it looked then a few hundred years ago. It’s the perfect place to keep in the shade in the summer with your loved ones, whilst enjoying a barbecue on the front door garden and a refreshing plunge in the swimming pool with Jacuzzi. On the first level, stoneware tiles have been used for the floor whilst upstairs, on the second level, it has been updated with parquet flooring. Downstairs, there’s the main kitchen and living room with an extra-large corner sofa and a dining table siting up to 12 people. It includes a flat screen TV and a chimney. The lounge has been separated from the dining room by changing the color shade of the walls from white to yellow. This room oozes plenty of charm with the beautiful chandelier hanging upon the main table which is in turn, a family antique. On this same floor there’s 1 bedroom with 2 single beds, 1 bathroom with a walk-in shower, a laundry room with a washer and dryer and what used to be the cellar of the house. Now an extra fridge has been included to keep conveniently all drinks within reach. Is the freshest room from all in the house and we have kept the old barrels as chill out tables for hanging out with friends and family. It can also be accessed from the outside. Following the staircase in the entrance up to the second floor, it leads to the rest of the bedrooms. They are all luminous and airy, bathed in sunlight all day long. There’s a double bedroom with an en suite bathroom and another 2 bedrooms sharing a complete bathroom, one with 2 single beds and the other one with a double bed. This is the only bathroom with a different shade of tiles in blue and is all the most elegant. This floor has a hidden surprise: a separate apartment! The perfect distribution for different families on holiday altogether that would like to keep a bit of privacy to them. This apartment includes a large living area with an open concept kitchen that is fully equipped except for a dishwasher. There’s a lounge area in the same room with a flat TV screen, a double sofa bed and a double bed, so possibilities are infinite here. It has been gracefully decorated with a framed print of Michael Angelo’s Cherub Angels in “The First Kiss”. Take your time to appreciate the little details of this beautiful Catalan farmhouse as all decoration and furniture has been carefully selected! This apartment has a separate bedroom with 2 single bedrooms and a complete bathroom. All bathrooms in this countryside house have the same fittings: walk-in shower with an outside window, large vanity mirror, sink with plenty of storage space and electric towel rails. However, to truly appreciate this majestic manor house, you will have to look at it from the outside. There’s a backyard land of 1.000 square meters dotted with centenary olive trees that were saved from an area affected by deforestation. It’s a great spot for the children to play and adults to hang around. It overlooks the private vineyard on one side and the town of Sant Pere de Ribes on the other side; a magical scenery within a tranquil setting with the Montgròs mountain on the horizon. When carrying the renovation, a strong wind blew down the carob tree in the backyard, leaving it mostly uprooted. It survived the clemencies of the weather and we proudly kept it to remind us to endure the hard times in life. - The signing of a rental contract for the stay will be requested. Please select a number of nights greater than 3.